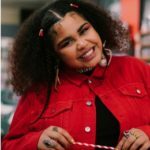 The soulful sounds of Kaiit accompanied by her band, performs two songs live on the TEDxSydney 2018 stage, Natural Woman as well as premiering her new track OG Luv Kush, Pt. 2. Next level amazing. With honeyed vocals, fierce rhymes and a bold eclectic style to match, 19-year-old Kaiit is alluring audiences to the sweet sound of soul. Born in Papua New Guinea, she bounced between Australia and her homeland as a child before her family eventually settled in Melbourne. Kaiit is blessed with an enchanting voice that crosses musical boundaries. Her love for jazz and neo-soul is evident in her music, drawing upon inspiration from her idols Amy Winehouse, Lauryn Hill and the contemporary sounds of Noname Gypsy and SZA. Kaiit’s artistic background in beauty and fashion is apparent in her inimitable style and edgy aesthetic.